FS2004 FSX United Airlines N218UA Star Alliance B777-200ER. 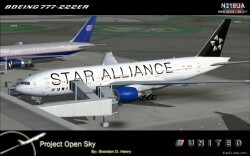 PROJECT OPENSKY BOEING 777-200 v2 for FS2004 FSX United Airlines Star Alliance Painted by. Brandon D. Henry [henry2724atcox. net] Copyrights. This aircraft is made by Project OpenSky.. . CREDITS. Model builder. Hiroshi Igami Yosuke Ube And with support of Posky members Virtual Cockpit builder. Jacob Kubique FDE designer. Brandon D Henry Warren C. Daniel Master Painter. Yosuke Ube Aircraft advisory. Corey Ford Aaron Seymour Features (in depth). Dynamic flexing wings Body gear steering under 15kt above 1kt. Nose gear steering under 60kt above 1kt. Rudder lock under 60kt above 1kt. Ground spoiler only works on ground. Low speed aileron locks at high speed. Fully animated control surfaces Fully independent suspension Trim Animation Opening Passenger Doors Animated tilting bogies Rolling wheels Animated thrust reversers Detailed textures Full night lighting Crash affects Ground Service Vehicles when Cargo door open And more.